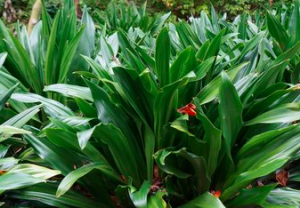 Sacred Lily from Japan is a stellar evergreen perennial that may not be dynamic and changing but it takes horrible dry shade and still looks good ( or the same ) year round. Rosettes that are somewhat elongated with scooped scrappy deep green arching leaves. Tiny white/green flowers in summer turn to bright red showy berries in fall and winter. Very slow growing for shade to dense shade and a champion in dry shade. To 1′ tall x 2′ wide Unmolested by slugs and snails. Light summer water. Takes sun but will turn yellow- not pretty. Japanese style gardens, overhangs, under outside stairwells. Cold hardy.